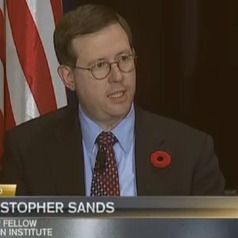 Christopher Sands is a Senior Research Professor and Director of the Center for Canadian Studies at the Paul H. Nitze School of Advanced International Studies (SAIS), a graduate division of Johns Hopkins University. Previously, he taught as the G. Robert Ross Distinguished Visiting Professor in the College of Business and Economics at Western Washington University (2012-20170 and as an adjunct professor at the American University School of Public Affairs (2005-2012). Dr. Sands was elected in 2017 to a two-year term as a member of the executive council of the Association for Canadian Studies in the United States, and he is a member of the American Political Science Association (where he served as treasurer and a member of the executive of the Canadian Politics Group from 2010 until 2017) and the International Studies Association. Sands earned a B.A. in political science from Macalester College in St. Paul, Minnesota inn 1989, and his M.A. in international economics (1994) and Ph.D. in international relations and Canadian Studies (2009) from Johns Hopkins.